Messier 78, or M78, is a well-studied example of a reflection nebula. It is located approximately 1600 light-years away in the constellation of Orion (The Hunter), just to the upper left of the three stars that make up the belt of this familiar landmark in the sky. In this image, Messier 78 is the central, bluish haze in the center; the other reflection nebula towards the right goes by the name of NGC 2071. The French astronomer Pierre Méchain is credited with discovering Messier 78 in 1780. However, it is today more commonly known as the 78th entry in French astronomer Charles Messier’s catalog, added to it in December of 1780. The dark ribbons are thick clouds of dust that block the visible light originating behind them. These dense, cold regions are prime locations for the formation of new stars. When Messier 78 and its neighbors are observed in the submillimeter light between radio waves and infrared light, for example with the Atacama Pathfinder Experiment (APEX) telescope, they reveal the glow of dust grains in pockets just barely warmer than their extremely cold surroundings (see eso1219). Eventually new stars will form out of these pockets as gravity causes them to shrink and heat up. In between visible and submillimeter light lies the near-infrared part of the spectrum, where the Visible and Infrared Survey Telescope for Astronomy (VISTA) provides astronomers with crucial information. Beyond dusty reflections and through thinner portions of obscuring material, the luminous stellar sources within Messier 78 are visible to VISTA’s eyes. In the center of this image, two blue supergiant stars, called HD 38563A and HD 38563B, shine brightly. Towards the right of the image, the supergiant star illuminating NGC 2071, called HD 290861, is also seen. Besides big, blue, hot stars, VISTA can also see many stars that are just forming within the cosmic dust strewn about this region, their reddish and yellow colors shown clearly in this image. 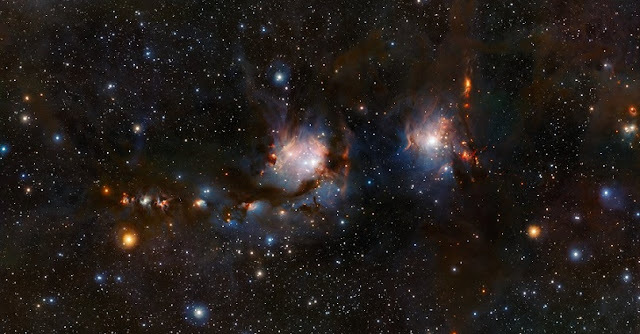 These colorful fledgling stars can be found in the dust bands around NGC 2071 and along the trail of dust running towards the left of the image. Some of these are T Tauri stars. Although relatively bright, they are not yet hot enough for nuclear fusion reactions to have commenced in their cores. In several tens of millions of years, they will attain full “starhood”, and will take their place alongside their stellar brethren lighting up the Messier 78 region.